Today we are covering how to enjoy ‘me’ time this fall before the holiday busyness begins. 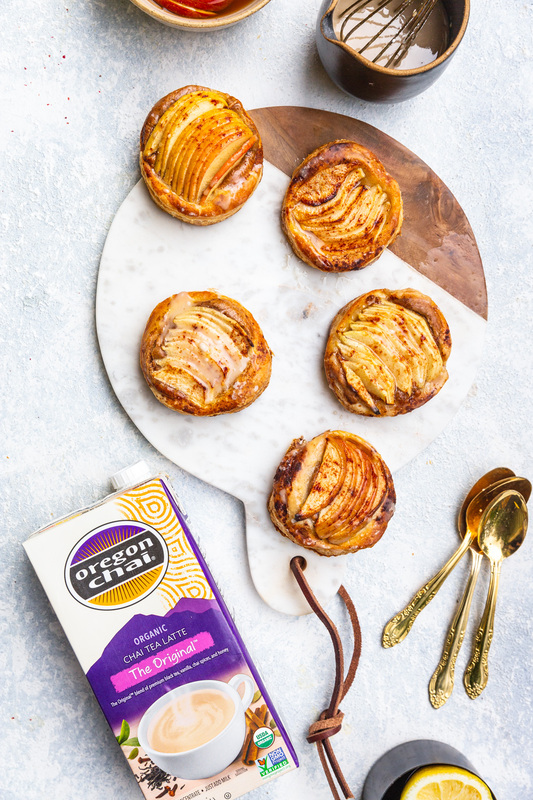 Plus, I’m sharing a recipe for these delicious and easy Chai Apple and Almond Puff Pastry Tarts. This is a sponsored conversation written by me on behalf of Oregon Chai®. The opinions and text are all mine. Thank you for supporting the brands that make VV possible. It’s no secret that chai lattes hold a special place in my heart (one of the first recipes on VV was a chai spiced cupcake recipe and I’ve featured the spice combo in many recipes since). My obsession with them first started when I worked at a coffee shop in high school, as it was my favorite drink item on the menu. Over the years, I’ve also come to associate the smell of a steaming cup of chai latte with fall – with the crunching of leaves, a big cozy sweater, pumpkin picking, and so much more. A spicy chai latte always seems to be my first choice when packing up a warm drink for a brisk walk in the woods to wander among the changing leaves. 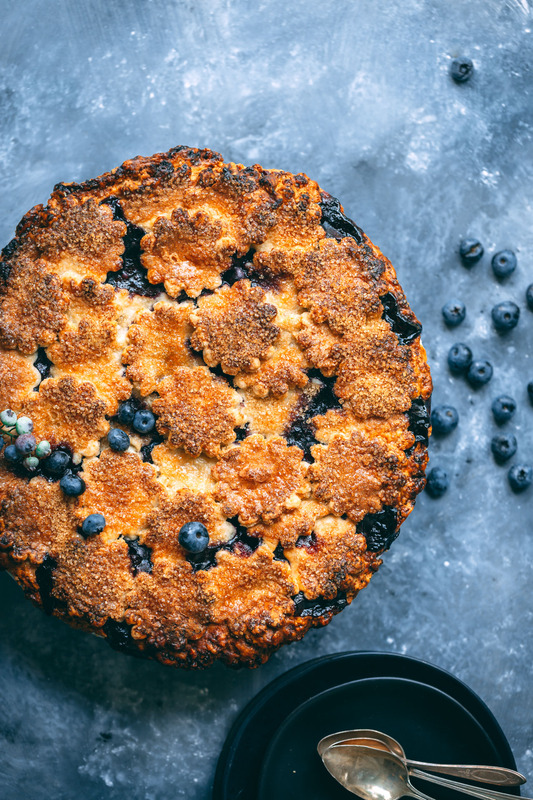 This Blueberry Lemon Pie recipe has a flaky crust and juicy filling perfect for a summer treat when blueberries are in abundance. As I’m sure you can tell by the recipes I’ve shared over the last few months, I usually shy away from anything too labor intensive. And to me, pie has always been at the top of the list when it comes to time consuming and finicky recipes. If I had my way, I’d just make cakes and quick breads for all special occasions but pie is Wyatt’s favorite so I’ve come back to trying to master it time and time again. I’m inpatient but persistent which is why I gave this pie making thing another go a few weeks ago after swearing it off last January when I made two ugggggly looking things for Wyatt’s birthday. I think my biggest issue, as a bit of a perfectionist, is that I’d spend hours in the kitchen working on a pie and it would come out of the oven so imperfect – the crust would shrink or there would be fruit oozing out of the seams. All the work and it’s not perfect? What’s the point. 15 Recipes To Make While Summer Fruit is in Season! 15 Recipes To Make While Summer Fruit is in Season! From drinks to sweets to savory items, these recipes will have you making fruit recipes all summer long! If you are anything like me, you can’t resist all the colorful and juicy fresh fruit currently stationed at your local farmer’s market. 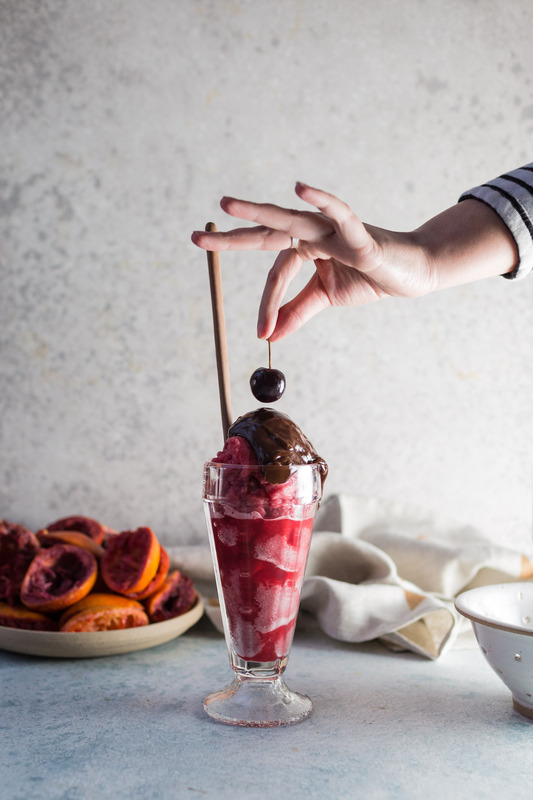 Summer fruit can be fleeting so here are some recipes to make sure you have an excuse to pick up those berries or stone fruit pints while they are around! 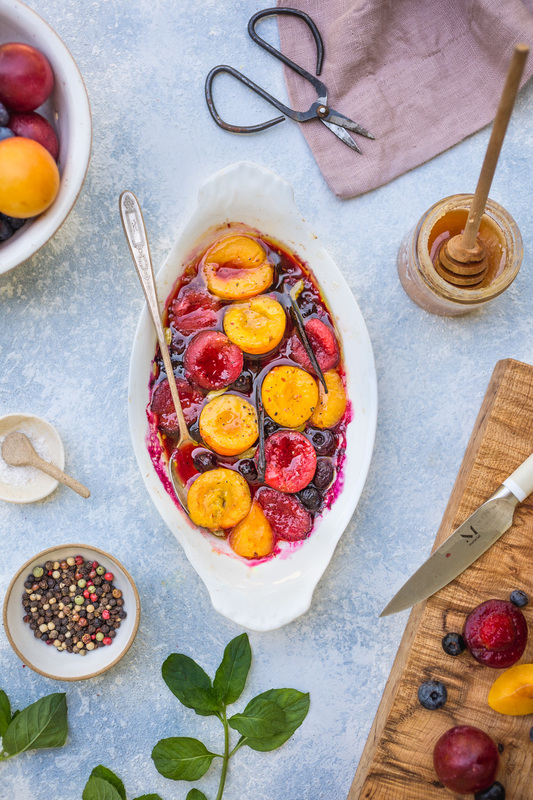 This versatile Roasted Plums and Blueberries with Cardamom and Vanilla recipe comes together in under 15 minutes and is the perfect summer breakfast or dessert when fruit is thriving at your farmer’s market. I picked up these beautiful plums and blueberries at the farmer’s market over the weekend and couldn’t resist whipping up something simple for the blogs with them. My usual favorite fruit combo is blueberry and peaches so I was pretty excited to try swapping in plums when I saw these at the market. Because their colors were so vibrant, I didn’t want to hide them in a pie or cobbler so I decided a quick roasting was the way to go. Instead of adding dried spices and extracts, I crushed whole cardamom pods and add vanilla beans for a subtle scent that melds into the fruit as it roasts. 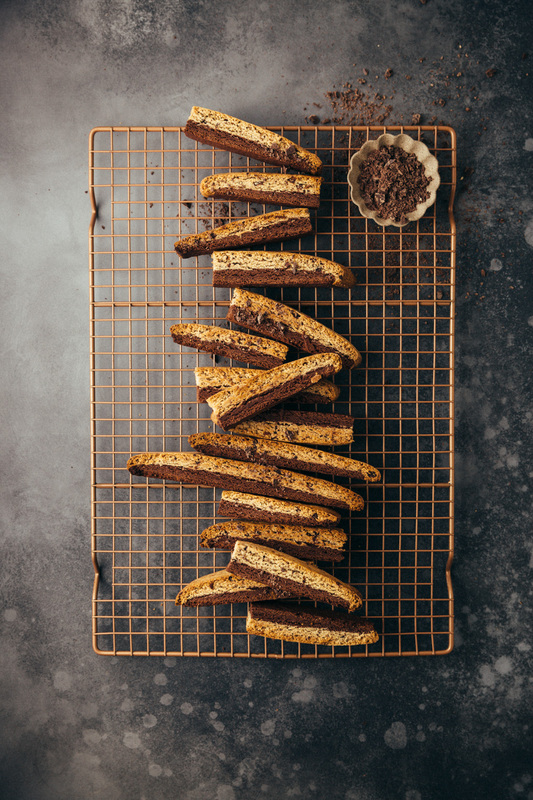 Salted Tahini Chocolate Chip Cookies + New Site Make-over! 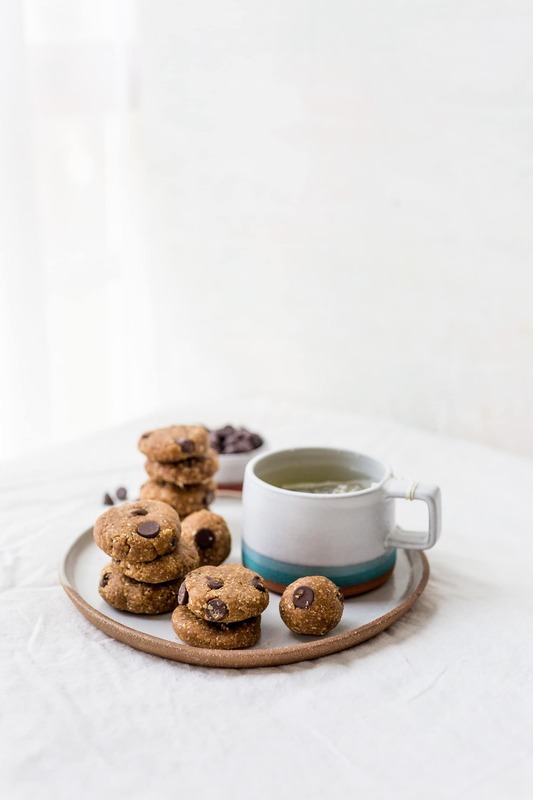 These Salted Tahini Chocolate Chip Cookies are the perfect hybrid between indulgent chocolate chip and a rich nut butter cookie. These photos are not anything special because I had not planned on even sharing this recipe on the blog. Originally, I had made these one Sunday night when I was out of freezer cookies (AKA cookies that I make a batch of and then freeze for later so I can easily bake 1 or 2 at a time). Normally chocolate chip is my go-to but I’ve been altering the batches slightly with small variations (like adding potato chips) and this time I struck gold with the variation. I decided to add tahini (thanks for a suggestion in the newest Food Network Magazine) and a heavy dose of sea salt topping and the results are a beautiful blend of chocolate chip cookie meets nut butter cookie (think peanut butter cookies). It’s the most beautiful marriage between sweet and salty and it’s just too good not to share with you all! It’s not everyday that you come across a dessert this easy with the end results being this amazing. Trust me and make a batch of these! 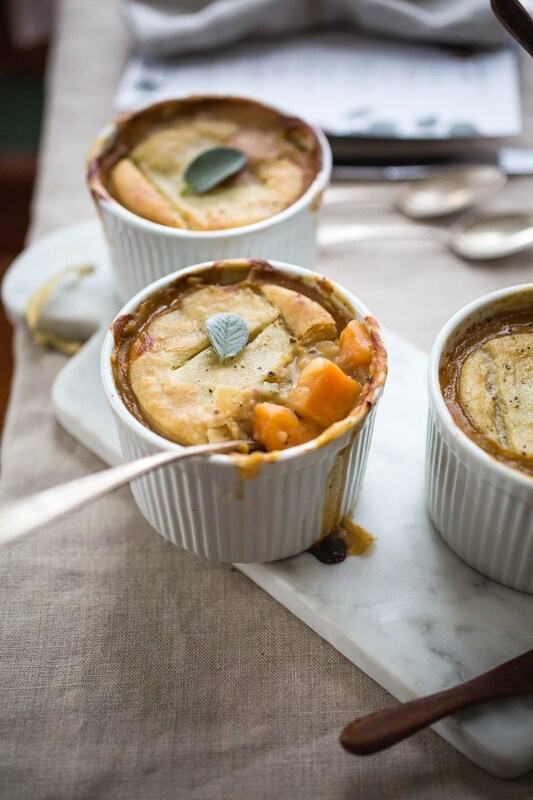 10 Vegetarian Recipes To Make Before Spring Is Over! 10 Vegetarian Recipes To Make Before Spring Is Over: Starters, Drinks, Entrees, and Desserts to make the most of the season! I shared a round-up of my favorite vegetarian spring recipes over on Instagram Stories the other week and realized I should probably go ahead and share them here in case you don’t follow me on IG. 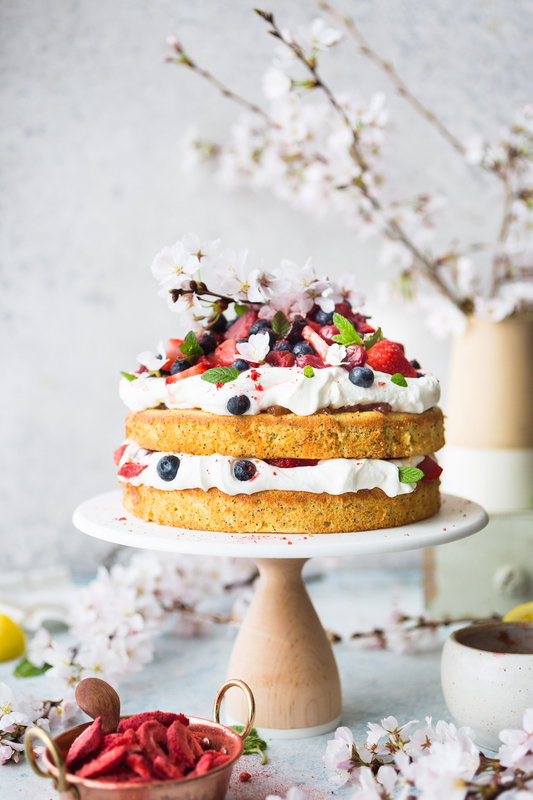 Spring is zipping by and before you know it, it’ll be too hot to even turn your oven on so hurry up and get in that kitchen with these recipes! This Roasted Strawberry and Rhubarb Grits with Toasted Pecans recipe is the perfect spring time weekend breakfast or dessert for your next dinner party. It FINALLY feels like spring here which is huge for my creative mindset and recipe developing. 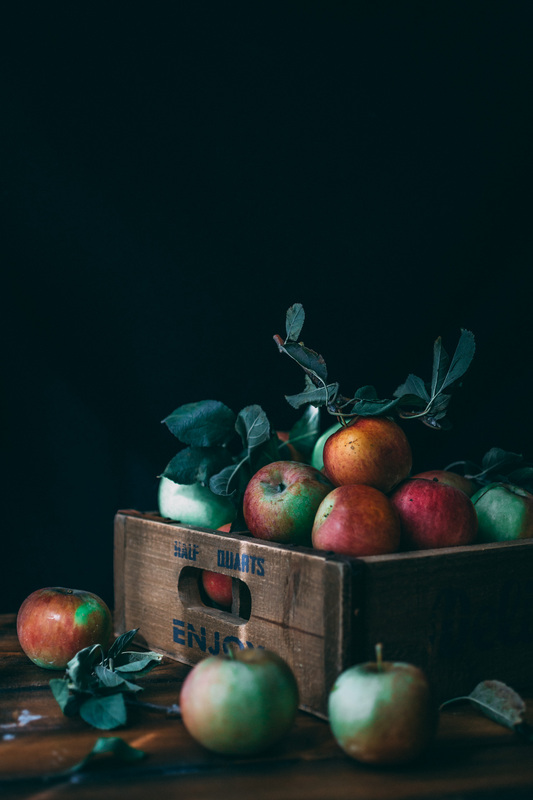 I was starting to a feel pretty bored with winter produce and annoyed with cloudy lighting. And then, what felt like overnight, everything changed. 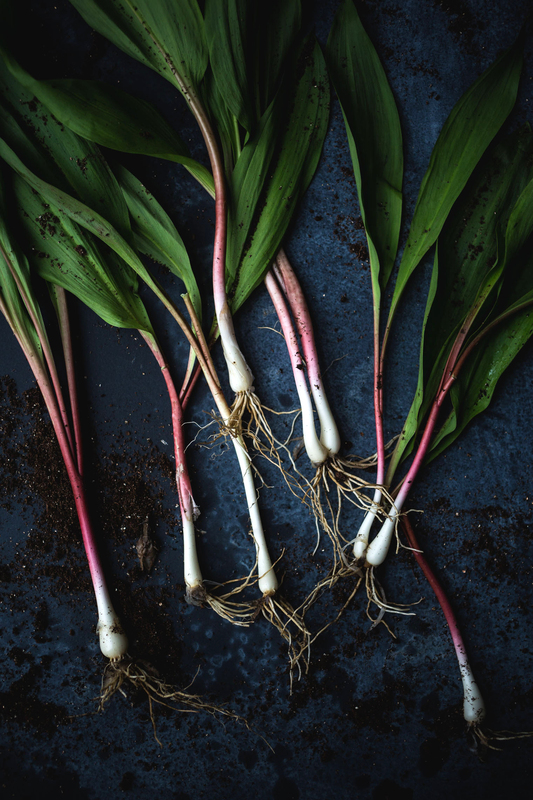 Our summer outdoor market opened up, the sun started to come out more than once a week, and rhubarb start popping up at all the stores. And although those are subtle changes, it completely awakened my creative juices and desire to jump back into the kitchen. For spring, I know it’s tradition to make a Strawberry Rhubarb Pie but I’m going to be honest with you…my pies of frustrate me. For one, I’m a cake person as pies tend to be a bit too sweet for me. For two, my crust is just never as good as it should be and I usually end up more disappointed than excited to eat the thing. All is well though because my lack of ability to whip up a pie means I have to get creative with fruit and think a little bit outside of the box. As soon as I picked up the rhubarb, I knew I wanted to roast it but I had originally thought I’d fold it into muffins afterwards. 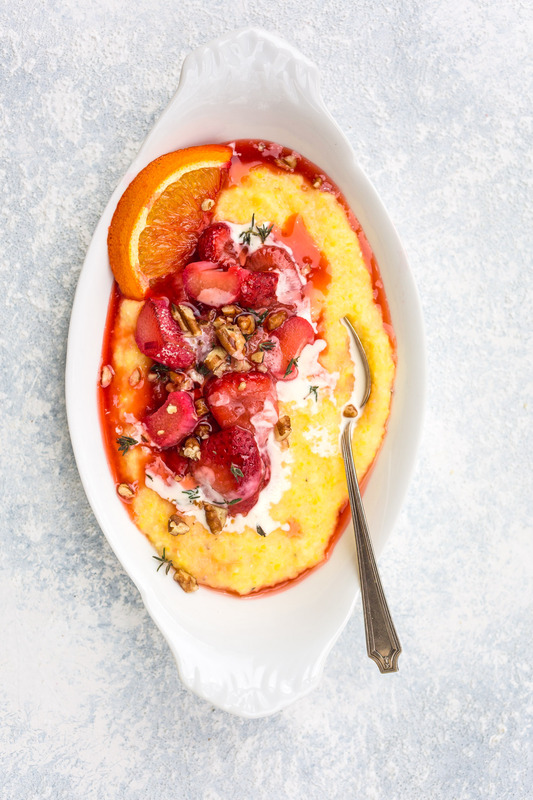 However, then I remember this delicious Roasted Plum Polenta recipe from last year and knew I wanted to re-create something similar with strawberries and rhubarb. For this Roasted Strawberry and Rhubarb Grits with Toasted Pecans recipe, I used frozen strawberries because fresh ones have not made it to my market just yet. Taste the strawberries you are using to see how sweet they are, mine were very tart so I’d recommend cutting down the sugar if yours are not as I had to overcompensate with mine. I love the addition of orange slices and thyme, which I added to the roasting process but removed before serving, as the oranges release juice throughout the roasting process and the thyme leaves just a touch of herb-y aroma. 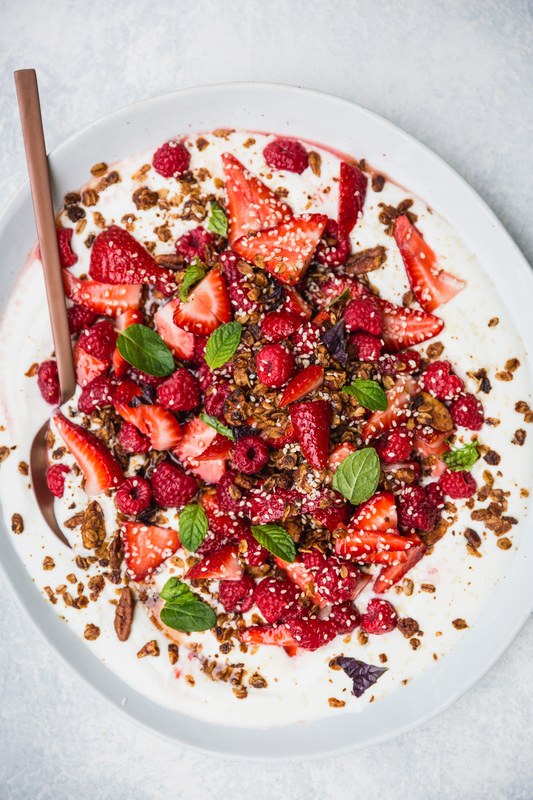 If serving for dessert, a splash of heavy creams gives a subtle nod to strawberry shortcake but you are serving for breakfast, plain yogurt is a healthier and almost-as delicious option. If grits are not your thing, try folding the roasted fruit into muffins or topping on ice cream. This Roasted Strawberry & Rhubarb Grits with Toasted Pecans recipe is the perfect spring time weekend breakfast or dessert for your next dinner party. Place orange slices and thyme sporadically around the strawberries and rhubarb (it will release juices as it roasts). Roast for 30 minutes or until the rhubarb is easily pierced with a knife. Remove from oven, transfer the orange slices and thyme to another try (to reserve for garnish), and set aside until the grits are ready. Bring water to a boil in a large saucepan with high edges. Once boiling, add the grits and salt and turn the heat down so they simmer. Cook for about thirty minutes, stirring often. Remove from heat and stir in the butter until melted. Taste and season with more salt if needed. Divide the grits between three serving bowls and top with the roasted strawberries and rhubarb. Drizzle with heavy cream or yogurt. Sprinkle with toasted pecans and garnish with thyme leaves and an orange slice. Serve right away. 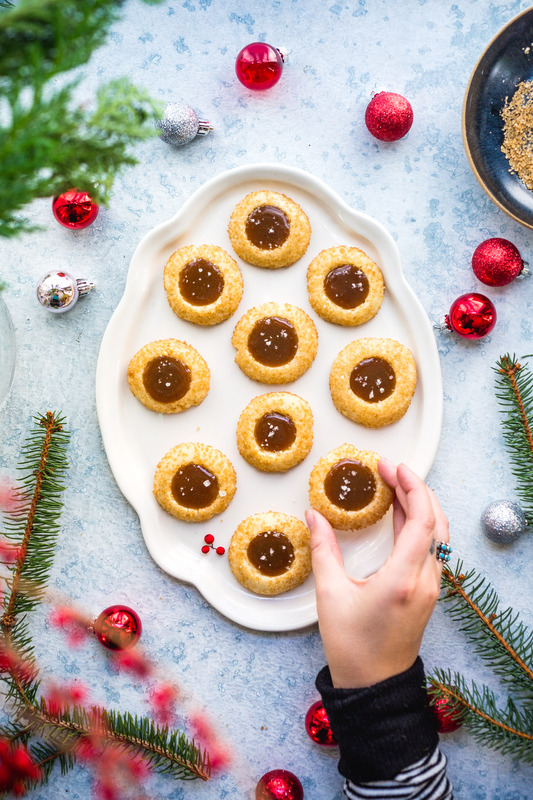 This Shortbread Thumbprint Cookies with Cardamom Orange Caramel recipe deserves a spot on your cookie tray this holiday season. It’s melt in your mouth buttery and spiked with aromatic cardamom and orange caramel sauce. 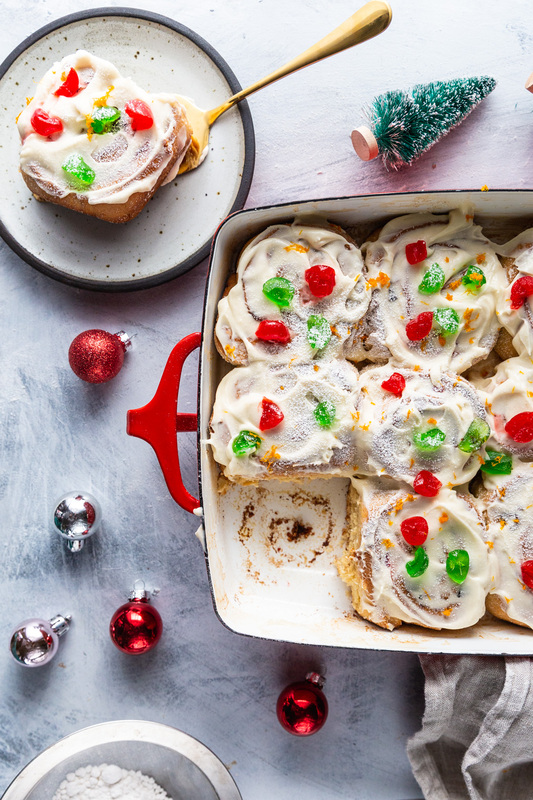 Wow – how did we already get to the last VV recipe of the year? It feels just like yesterday I was whipping up this Creamy White Chili and fretting about the political future of our country. So much good has happened this year for me – I released my first cookbook, we bought our first home – but I won’t go into too much detail yet as I usually do a yearly wrap up that is still to come. For now, I need to focus on the fact that Christmas eve is ONE WEEK AWAY! I haven’t even started shopping yet. Yikes! Have you ever had those Danish shortbread cookies that come in all sort of different shapes in the blue tin? My brother and I always received a tin for Christmas growing up and I remember so vividly fighting over who would get the sugar coated pretzel shaped one because that was our favorite. It makes me smile now because they were all the same cookie but just different shapes but I was so positive as a kid that I didn’t like the round ones, only the pretzel and square ones. Anyway, I bring this up because these taste exactly like those cookies. Well, exactly like those cookies + more because of the citrus-y caramel sauce. Speaking of this caramel sauce, it’s good. Like lick the spoon and be-careful-you-don’t-eat-it-all-before-you-put-it-on-the-cookies delicious. The cardamom is subtle but compliments the bright citrus and sweet caramel flavors perfectly. It reminds me a bit of nutmeg in the way that most non-bakers might not be able to put their finger on what it is they are tasting but they just know they like it. Anyhow, hope you have a wonderful holiday season and I’ll probably check in one more time before the end of the with my annual yearly wrap up. Until then, catch me on Instagram because I’m obsessed and post over there daily. This Shortbread Thumbprint Cookies with Cardamom Orange Caramel recipe deserves a spot on your cookie tray this holiday season. 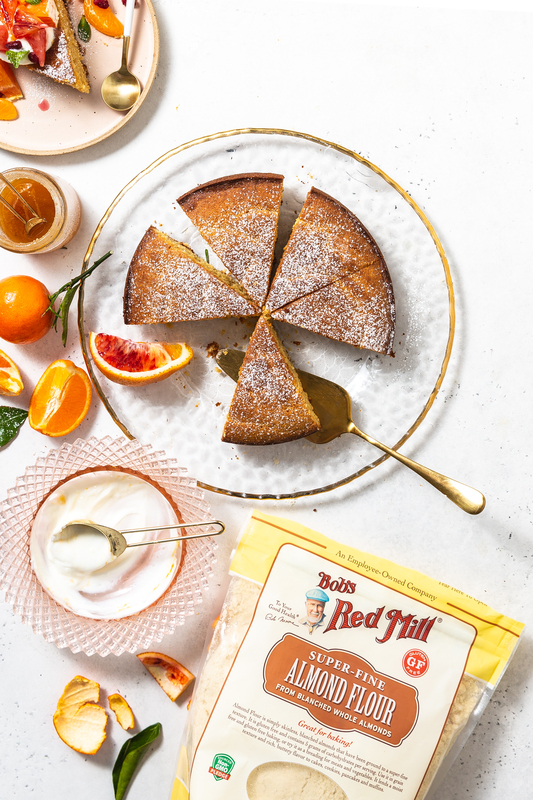 It's melt in your mouth buttery and spiked with aromatic cardamom and orange caramel sauce. In the bowl of a stand mixer fitted with the paddle attachment, cream together the butter and 2/3 cup sugar. With the stand mixer running on low, add in the vanilla extract and salt. Next, add in the flour slowly and mix until the mixture comes together to one big dough ball. Place coarse sugar in a shallow dish and set aside. Scoop heaping tablespoons of dough and use clean hands to shape 1-inch balls. Roll the ball in the coarse sugar until completely coated and transfer the dough balls to the prepared baking sheet, 2 inches apart. Use a wine cork or your clean thumb to press a small indentation into each dough ball. Transfer to the freeze and let chill for at least 10 minutes (this will make sure the cookies don't spread too much while baking). Bake for 14 - 18 minutes or until browned on the bottom. Remove from oven and use the cork to press down on the indent again if it puffed up while baking. Transfer to a wire rack and let cool. While the cookies are baking, combine the brown sugar, cardamom, and unsalted butter in a small saucepan. Cook over medium heat, stirring constantly, until the mixture begins to boil. Once boiling, continue to cook for one minute, stirring constantly. Remove from heat and stir in the cream and orange extract. Set aside. Pour the caramel sauce into the indents of the cookie and sprinkle with a tiny bit of coarse sea salt. Today’s post features the recipe for Cookie Dough Balls from The Savvy Cook. These no-bake cookie bites are about has healthy as you can get while still tasting like indulgent cookie dough. One of the last things I did before heading out on my week long road trip last Sunday was whip up a batch of these cookie dough balls for easily snacking in the car. I’ve made these bites 3 or 4 times now since they can be made in less than 5 minutes and involve ingredients I usually have on hand. 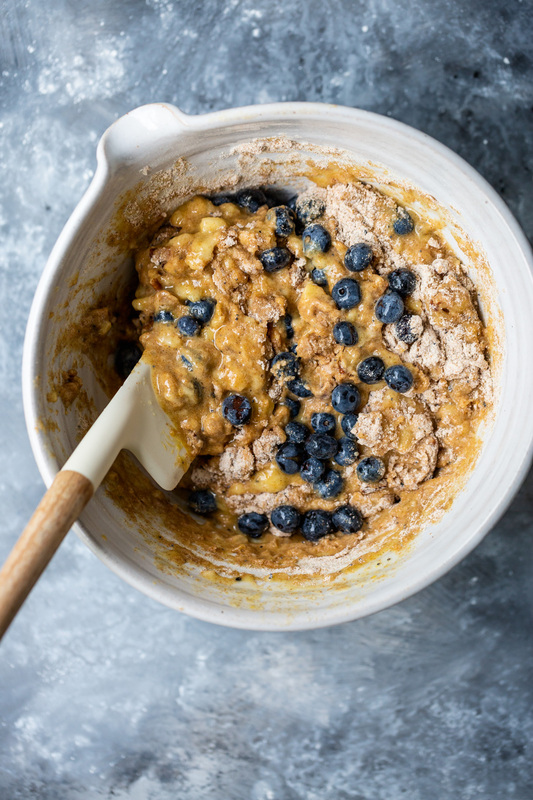 The original recipe calls for making a date paste ahead of time and then just throwing it all into a bowl and mixing together but I prefer to throw all the ingredients (except the chocolate) into a food processor and let that do all the work. The results are a much finer oat which I think gives these bites even more of a dough like texture. I also like to flatten them out like small cookies but keeping them in ball form is also an option. This recipe comes from Izy Hossack’s The Savvy Cook which came out last month. If we are being honest, a ton of vegetarian cookbooks came out this spring (including mine!) so I was surprised to make such a connection with this one. Izy’s cooking style is super similar to mine in that it is very veg heavy, she uses miso often as a flavor boosters, and her recipes are easily to prepare. I’ve made several from her book already but the two I keep coming back to are this recipe and her cauliflower mac and cheese which has you pureeing blanched cauliflower into the cheese sauce for a healthy twist on the comfort classic. Besides the recipes being approachable and delicious, the photography is stunning and I find myself flipping through the pages for inspiration on the daily. All in all, if you are a vegetarian and feeling a little stuck in your weeknight meals, pick up this book! In other news, I’m back to the routine today after the road trip and it’s going to be a busy week. I put off a lot of things because I knew I was going to be away last week so I have 7 interviews for Vegetarian Heartland this week on top of catching up on everything. The one this afternoon is for Heritage Radio which I am extra stoked about – I’ll make sure to post a link at a later date if it turns out well! Today's Simple Sunday post features a Cookie Dough Balls from The Savvy Cook. 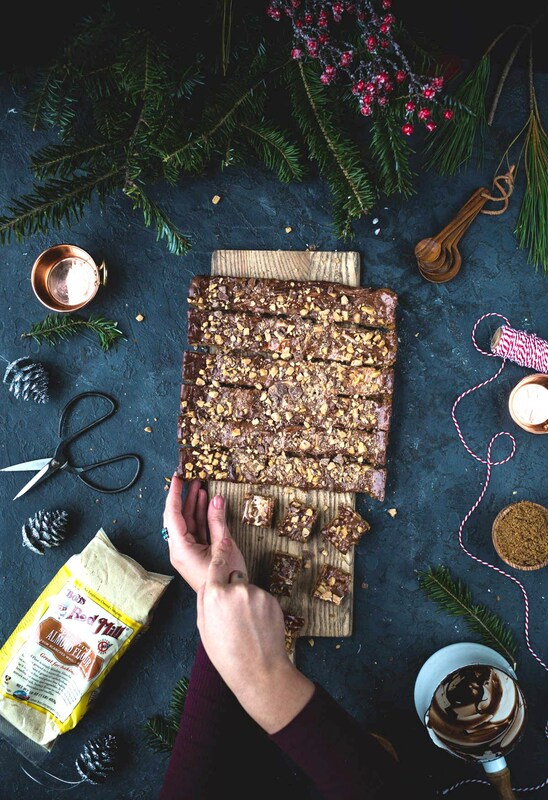 These no-bake cookie bites are about has healthy as you can get while still tasting like indulgent cookie dough. Place all ingredients except the chocolate chips in a food processor and blend until well combined. Transfer to a small bowl and mix in the chocolate chips. Roll heaping teaspoons of dough into balls and place on a plate. Enjoy right away or let stand for 30 minutes to dry them out a bit before transferring to a sealed container. Store in the fridge for 3 to 5 days. 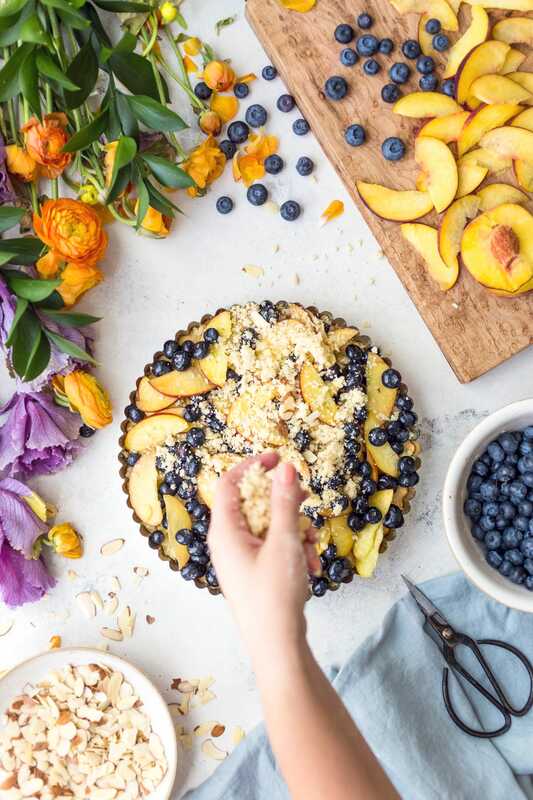 This easy Almond Peach Blueberry Crumble Slices recipe is perfect for summer entertaining. Make sure to wait to make this recipe until peaches are in peak season. This space often times gets marked as a ‘health’ blog or ‘diet’ space by marketers and other websites. I guess I get it – eating vegetarian and vegetable focused meals can be healthy but there is no where on here that I ever call it that. Sure, I love me some quinoa taco meat and a protein smoothie but I also love buttery baked goods, chocolate (so much), and an alcoholic drink here and there. In fact, I’m pretty sure that VV has a high ratio of baked goods recipes because baking is how I like to relieve stress and get playful in the kitchen. 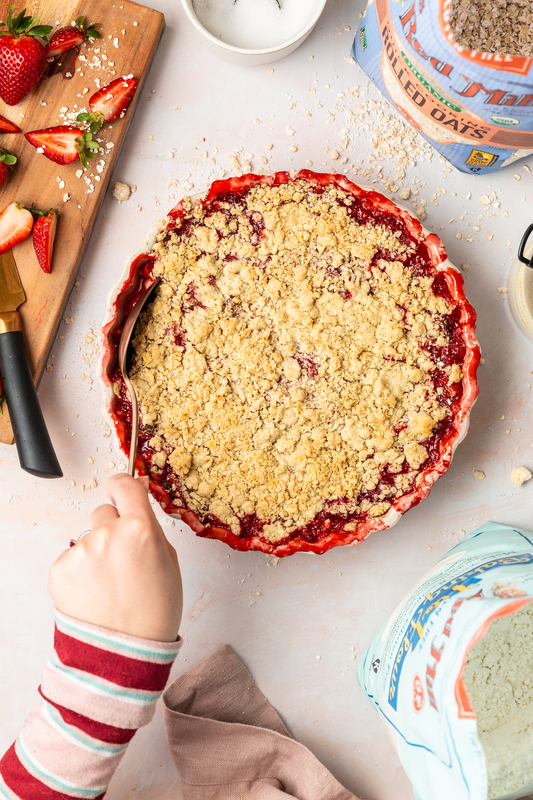 I think that what I am getting as is that this recipe is in no way “healthified” – it’s just a darn good and delicious crumble recipe that focuses on the fresh fruit our bountiful summer is supplying. 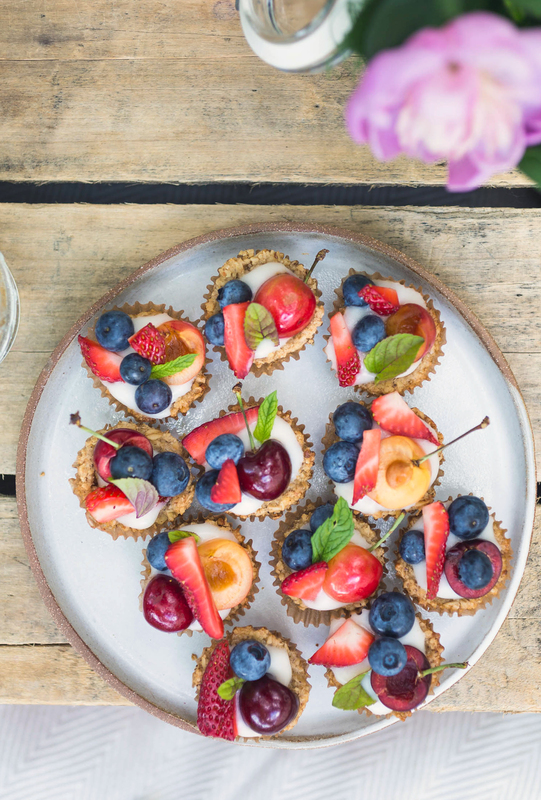 Fruit & Yogurt Granola Tarts + Vegetarian Heartland is out TODAY! Fruit & Yogurt Granola Tarts recipe from Vegetarian Heartland Cookbook + an all vegetarian picnic spread worthy of any lazy afternoon! I just f’king can’t believe it. There are not enough words in the world to describe what I’m feeling today. Today is the day that Vegetarian Heartland, my first cookbook, is finally out in the world! I still remember April 18th, 2014 like it was yesterday – I called my parents and then my grandma to tell them I would be signing with a literary agent to work on my first cookbook. My grandma’s first question was ‘when does it come out?’ and after I explained to her that it would probably be a few years as I still needed to write a proposal, get a publisher, write the entire book, and then photograph the whole thing, she scoffed and said ‘well I’ll be dead by then’! Fast forward 1,115 days (3 years, 2 months) and here it finally is! 80+ vegetarian recipes + all the photos you could image that include adventuring around food + my last few years documented in cookbook form. Oh and I’m happy to report that my grandma is still kicking and thriving at 87! 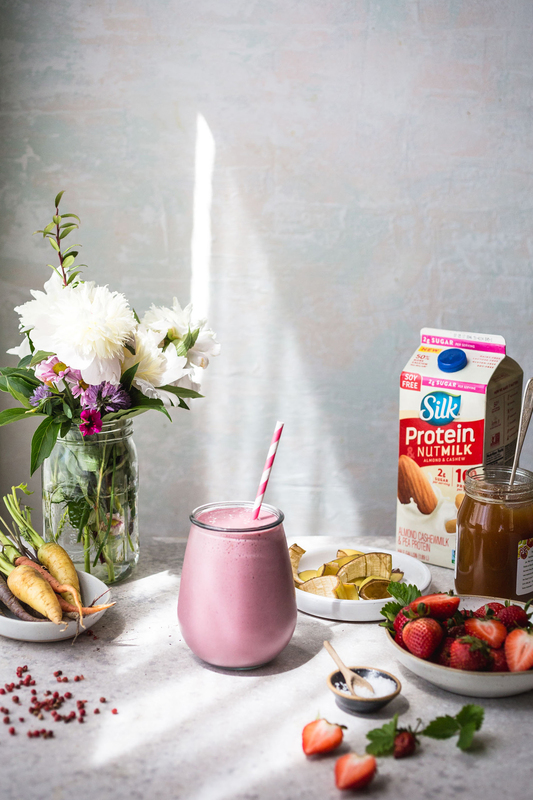 This Strawberry Pink Peppercorn Protein Smoothie recipe is great as a filling breakfast or post workout drink. If you know me in person then you know that I’m a big day dreamer. Some of my day dreams have turned into reality (hellloooo book deal) and some of them are just crazy (helloo mansion on the ocean with an indoor / outdoor kitchen and 3,000 square foot studio room). I think that Wyatt often times takes my day dreaming remarks as signs of not being happy but really I just like to make up scenarios and play them out over conversation. I think I probably got this from my parents who, when my brother and I were little, used to take us for drives in the “gated communities” and talk about what it would be like to own one of the million dollar homes. One of the big things I talk about is what it is like to move to another city; I think it is because we kind of organically ended up where we are instead of intentionally saying we were going to take root here. It’s funny because I am actually terrible at change but my mind still starts to wander to other life scenarios after things have been normal for too long. I’ve been thinking a lot about my day dream tendencies lately because I’m headed to Portland tomorrow for a weekend trip. Portland was one of the places I dragged Wyatt to after college because I was certain we should move there. We absolutely loved the city and all it had to offer. However, as with all of the trips I drag him on to check out new cities, it didn’t feel like home and we were happy to return to our little college town in the Midwest. BUT it’s still a wonderful place to visit and I’m so excited to go back – any recommendations for places I should see / eat / hang out while there? Moving on to this smoothie, I’m pretty beyond stoked to have smoothie season back again. With our brutally cold winters here, I can’t bring myself to drink smoothies between September and April (all I want is hot tea). As the weather warms and I start to move my body more, it also craves refreshing fresh vegetables and fruit so smoothies are the easiest way for me to feed those cravings. To be honest, my usual go-to are green smoothies but I was feeling something a little more sweet this time around (although a cup of spinach would still be fantastic in this recipe if you wanted the extra green boost). The secret ingredient here is the pink peppercorn. As with most spices, we are only using the tiniest amount to enhance the overall flavor of the smoothie without completely overwhelming it. We want the end result to have the faintest peppery bite without anyone (besides you since you are making it!) being able to put their finger on exactly what is creating that spice. Also, I rarely make the same smoothie twice because I’m always just using what I have on hand. 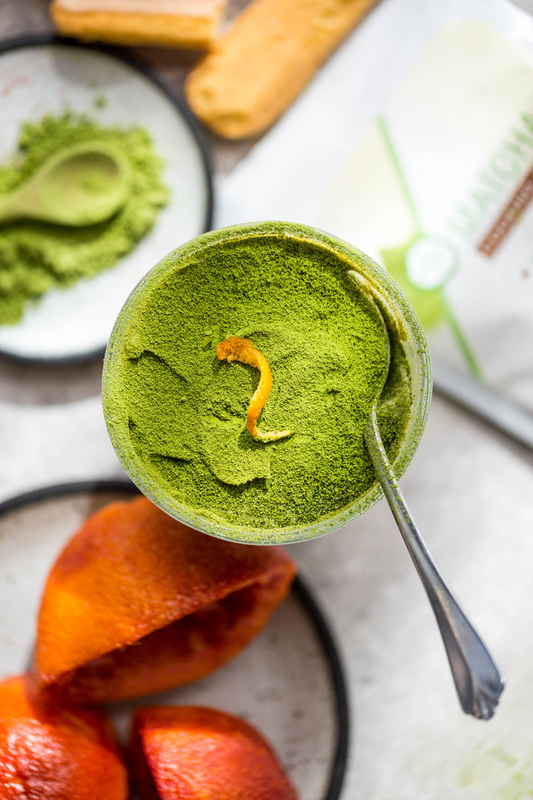 Here are a few mix-ins that I bet would be great with this smoothie: 1 cup spinach, ground flaxseed, or even beet powder (which I weirdly have on hand because I’m a total food nerd). Add all ingredients into a blender and blend until completely smooth. Transfer to a glass and enjoy right away.